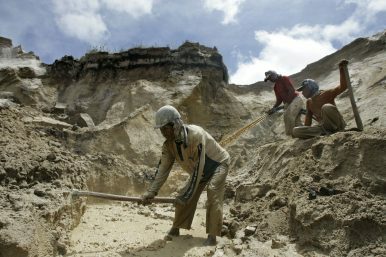 Traditional gold miners use a high-pressure water jet to blast through soil at a mine in Hampalit, Central Kalimantan, Indonesia, April 24, 2008. Indonesia is one of the world’s agricultural and mineral breadbaskets. Flip a coin to find whether the palm oil in your biofuel, shampoo, or most of your processed foods comes from Indonesia. There’s a one in three chance just two islands the size of Northern Ireland produce the tin in your phones and packaging. The archipelago has just as firm a hold on the rubber and nickel sectors, and it is among the top 10 most influential countries for a dozen other products found around the world. It’s a country whose economy relies on the management of land – and where the lines between governance and business often blur in a track record of extralegal money exchanges at the expense of local residents and the environment. Indonesia will go to polls on April 17. But the natural resource industry has evaded policy discussion from the two presidential hopefuls – even as it provides almost complete funding for both candidates, incumbent Joko “Jokowi” Widodo and Prabowo Subianto, who also faced off in 2014. Campaigns have been tame, focusing on decreasing prices, expanding infrastructure, and putting Islam and nationalism at the center of discussion. One debate was meant to focus on their strategies for overcoming the corruption and destruction linked to the archipelago’s natural resources, but after listing the necessary buzzwords, both candidates paused. And with that, natural resource policy was opened and closed in the world’s biggest elections. But the natural resource industry is far from having departed the elections – the campaigns have been almost fully funded by the natural resource industry, according to the latest numbers. Advocates say each team is inextricably tied to the industries in a web that involves candidates, the campaign teams, and their business associates around the country. Such uniformity between both teams’ funding may explain why policy platforms are so similar. “We express our gratitude and appreciation to both individual and group donors for these seven months,” said the campaign manager for Subianto and his running mate Sandiaga Uno, knowing full well that 98 percent of funding came from the businesses of the two candidates. They have almost completely funded their run for office with funds from their businesses in energy, infrastructure, mining and agriculture. Subianto himself still owns vast tracts of land used for plantations and mining. Uno provided 61 percent of the funding, or $8.1 million, from his businesses, the most prominent of which, Saratoga, has hands in everything from gas to mining to transportation. Uno, meant to be economics expert of his team, said recently he’s spent roughly $100 million on the campaign, but none of that money has been reported to the General Election Commission. A report released Tuesday by Global Witness, an NGO investigating resource corruption, finds links between Uno and $43 million in payments from a coal company to an offshore firm, after which the coal company defaulted on debts. Global Witness, however, doesn’t shed a bright light on the Jokowi camp either. Luhut Pandjaitan, a close friend of Jokowi’s and coordinating minister of maritime affairs, has not revealed the buyers of his coal company, another report concludes. Jokowi’s camp, with Islamic cleric Ma’ruf Amin as vice presidential candidate, collected fewer total funds at $9.2 million, but in no less shady a fashion. They were helped by two shadowy donations from two groups called Perkumpulan Golfer, or Golfers’ Club, that at one point totaled two-thirds of all funds. Currently, it comprises about a third at least. An investigation by anti-graft advocate Indonesian Corruption Watch revealed both groups were tied to a businessman, Wahyu Sakti Trenggono, who owns companies invested in mining, plantations, and infrastructure projects. He also acts as treasurer for the Jokowi campaign team. Although the two Perkumpulan Golfer funds do not individually violate the election laws restricting any one group from contributing more than $1.7 million to a campaign, together they pass the limit by almost $1 million. ICW called for an investigation into the funds in January, but there has been little follow up. All this money remains unbalanced with the few commitments to address Indonesia’s history of corruption, violent evictions, and land grabbing, advocates say. Many voters – the total of whom alone would make the world’s seventh biggest country – don’t share the candidates’ indifference to the industries. For them, the industry is more than just an elephant in the room; it’s also a puppet master. When Indonesia’s strong natural resource industry expands, it needs land. In a country where most small-scale workers live off the land without ownership in writing, government often favors company claims on the land, citing tax and job benefits, but often leading to heavy pollution and irreversible landscape change. The top two causes of land conflicts, which have led to dozens of deaths in the Jokowi era alone, have been plantation and infrastructure development, according to the Agrarian Reform Consortium, an Indonesian advocacy NGO. Jokowi’s main platform is infrastructure; Prabowo has said he’s intent on expanding plantations, especially palm oil. But only Jokowi has made the commitments to change, says Suraya Afiff, an anthropology professor at University of Indonesia who studies environmental and agrarian issues. Documentarian Dandhy Dwi Laksono says businesses have funded elections for so long that voters have normalized “paratrooper politicians,” candidates especially in Indonesia’s regional election who run for office with little background in the area. Voters will choose from more than 245,000 candidates for more than 20,000 seats on the same day that they choose a president. “Because of that, when issues in politics are tied to the exploitation of natural resources, those issues become too distant for the general voter, unless they are directly affected,” said Laksono, who says he will abstain from voting for a president this election. Abstentions are hardly a new form of protest, but this election round may be worse for Jokowi. His 2014 win was the closest in Indonesia’s (admittedly short) election history, after already having won over indigenous and land rights groups for the first time in their history. His outspoken plans to combat agrarian conflict and corruption in the business sector persuaded many former abstainers to put their faith in the furniture salesman from Java. Let down, these voters may threaten Jokowi’s base. “Politicians have become loyal to sponsors not to the communities who become essentially victims of the election,” Johansyah said. Ian Morse is a journalist based in Sulawesi, Indonesia. Ahok's defeat says less about the rise of Islamism and more about the strength of entrenched political interests.